– Put the pegboard upside down and trace the holes in the board. 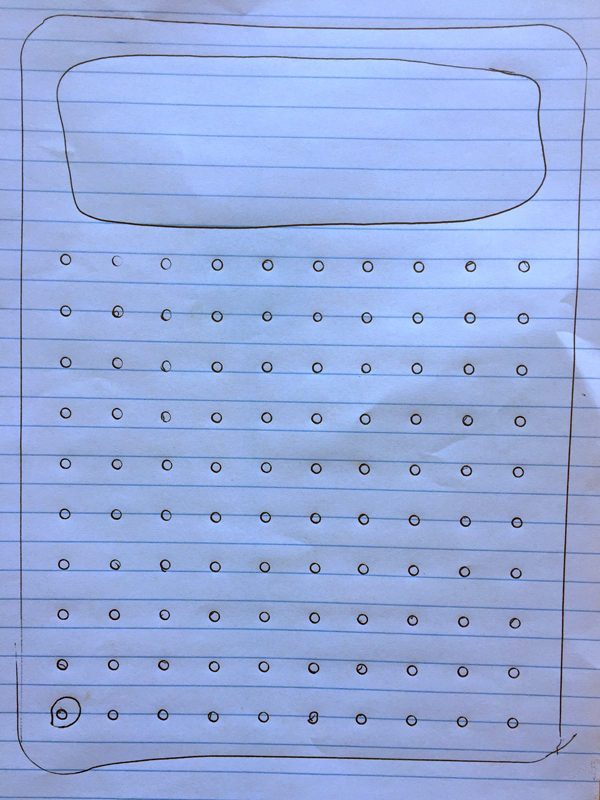 Draw a circle around a dot to show them where they should put a peg in the board. This will help them draw the connection between the pegboard and its cards. – Now show them Card 1 and tell them about the boy on the card and how he wants to get to his dog on the other side and that he has to follow the red line to get to the dog. Show them how they must fill the first row with red pegs for the boy to follow to get to the dog. Do the same with the blue, green and yellow lines with the dog and cat, cat and mouse and mouse and hole. 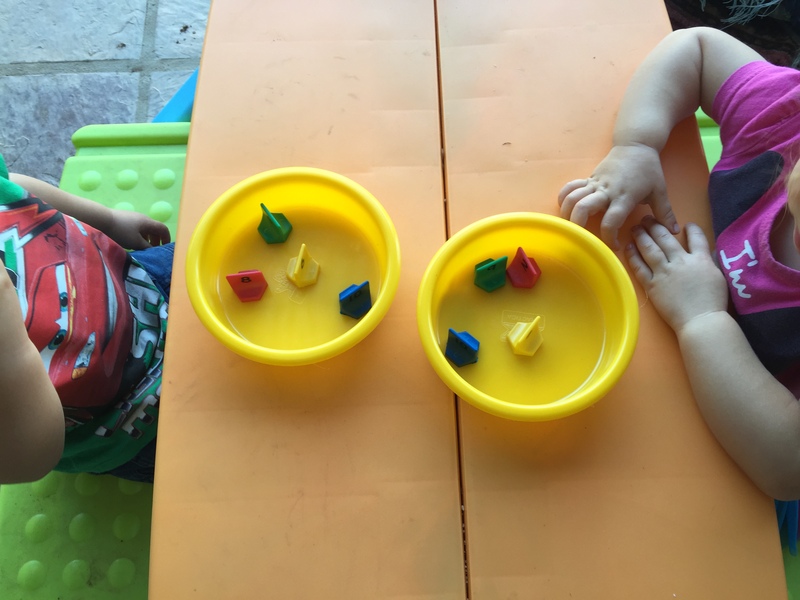 – Give each toddler or mom/toddler each a sorting bowl and play “one for me, one for you”. 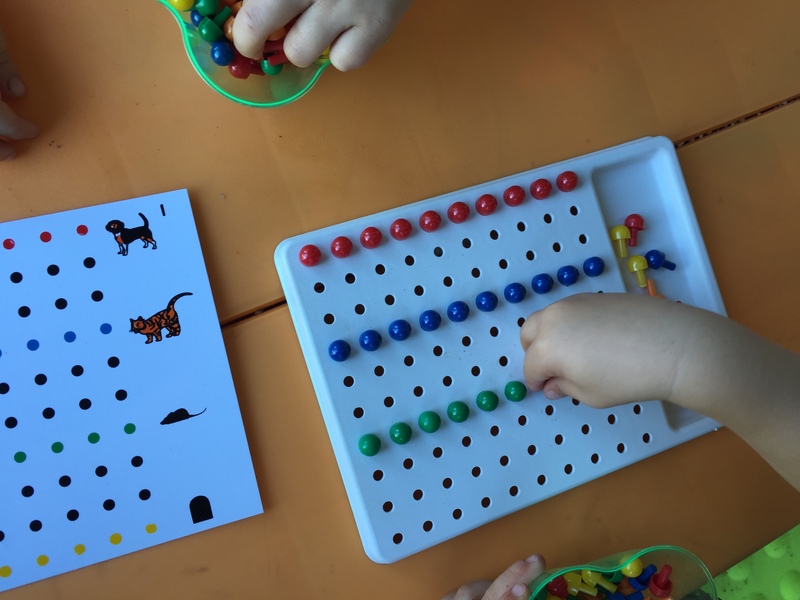 This teaches them to wait… name each color as you are sorting… “One blue button for mommy, one blue button for Pieter.” etc. – Now let him do the sorting. IF theres two toddlers, give each a chance. Describe each action… “One for mommy, one for Pieter” “One red button for Pieter, one red button for Hanlé” etc. This teaches them to share. – Now let each take their own button and repeat “Each take one green button. Now each can take TWO yellow buttons… wow! One, two yellow buttons each…” This teaches them to take only what they are told. – Place a shoelace on the floor as a starting point and let her stand with both feet behind the shoelace. Show her how to jump with both feet as far as she can. Measure with the Hex Counters (or Popsicle sticks like I did) after every jump and write the results on the black board. Well thats it for now folks… please like the Facebook page and follow this blog to stay in touch for more awesome Practica activities. For more fun Practica activities, click Here! For more about the Practica Program, click Here! * Disclaimer: I am not a spokesperson/ promoter/ reseller of Practica. I share my activities, often adapted for my children with other mothers who also have the Programme or would like to know more about it. I will not be held responsible for any damage and/ or injuries obtained while following my instructions.